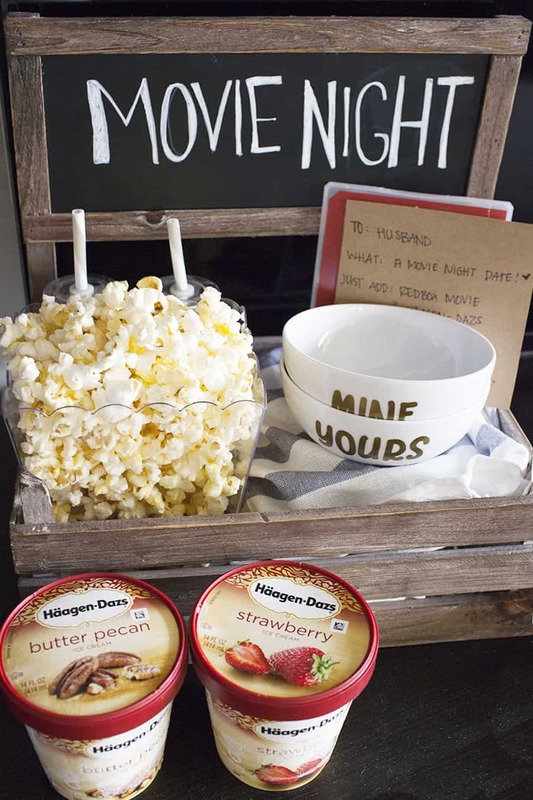 This movie night date crate is the perfect way to have a date night at home while your little one is asleep! 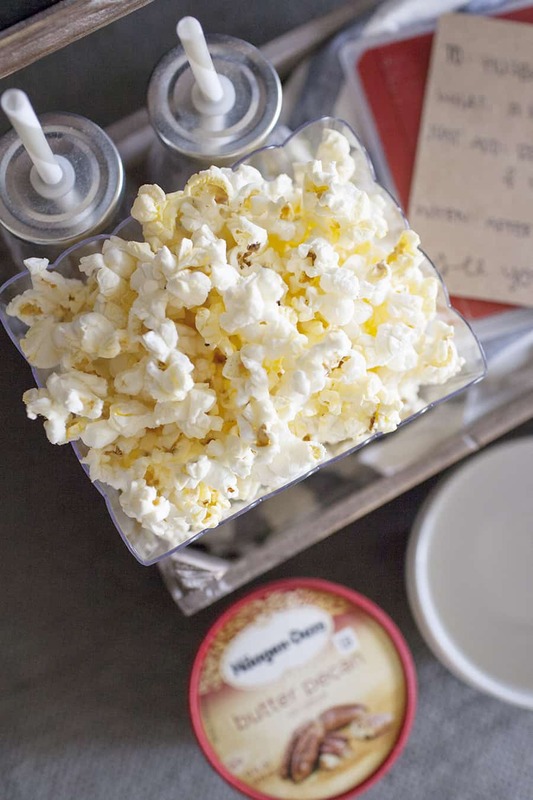 Share some popcorn, a movie and ice cream in these DIY “yours and mine” ice cream bowls for a quiet date night at home. Even before Greyson was born, we have always enjoyed our quiet evenings at home. It’s definitely always fun to dress up and go out on a dinner date, but there’s something equally as special to us about curling up on the couch to watch a movie together. Steven is a big movie buff, while I could probably name on two hands the movies I’ve seen this year so far. However, we both always agree that if we are watching a movie together, it’s going to be a great night. 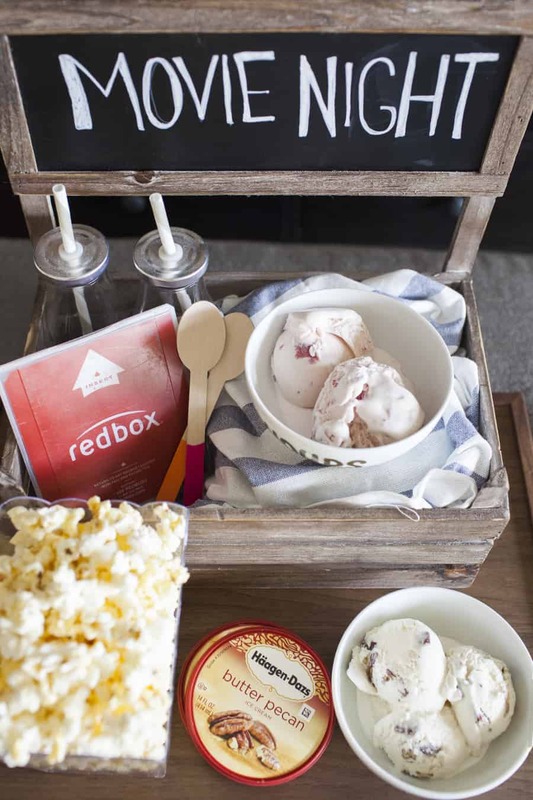 For a fun date night, I made this Movie Night Date Crate for Steven to “invite” him to a special date night in watching a Redbox and eating ice cream together. 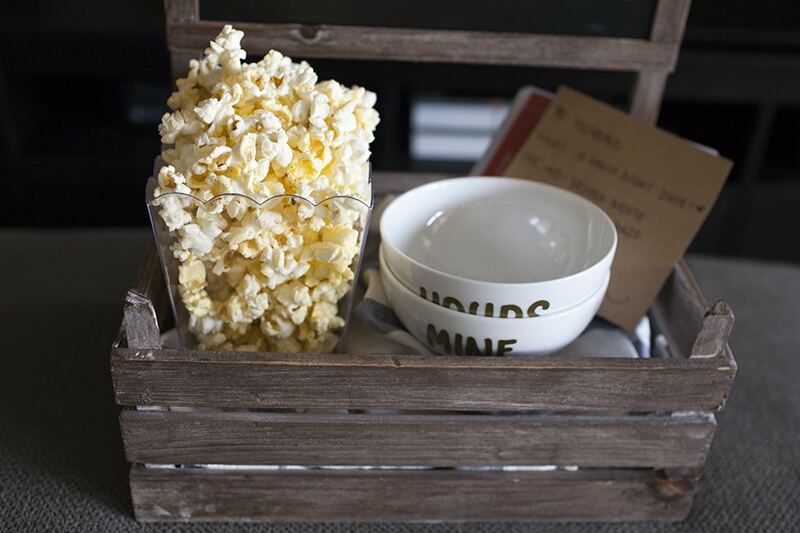 No movie night is complete without popcorn either, so this date crate includes that as well as some cute bottles to enjoy whatever beverage sounds good to us for the evening. 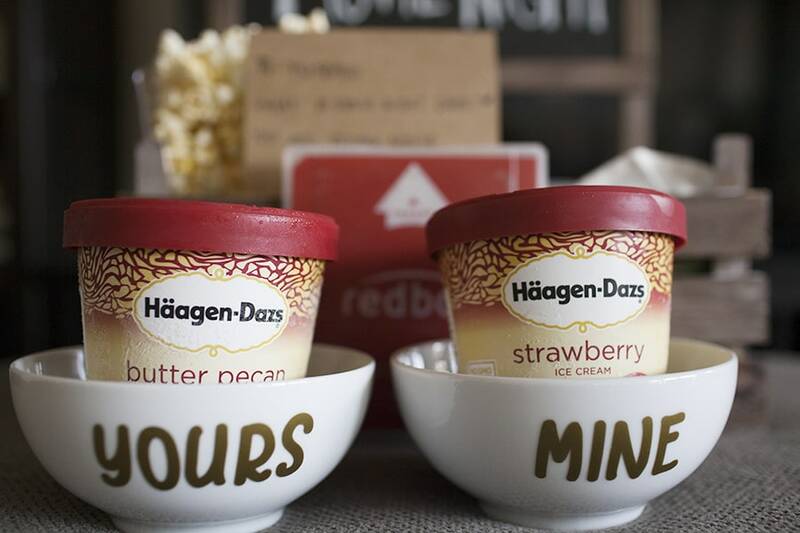 We can share ice cream flavors, but tend to have a craving for something different so we usually indulge in our own Häagen-Dazs pints. One of my all time favorite ice cream flavors is Strawberry and Steven loves Butter Pecan. To go in this date crate, I made us our own ice cream bowls so we know exactly whose is whose. Try these no churn ice cream flavors! Some of the best ice cream recipes without an ice cream machine! As new parents, it’s really easy to get complacent about spending quality time together. For Steven and I, quality time is one of both of our love languages, so we know it’s important for us. When there’s a baby in the mix, it’s easy to be “too tired” or just simply forget to prioritize time together. 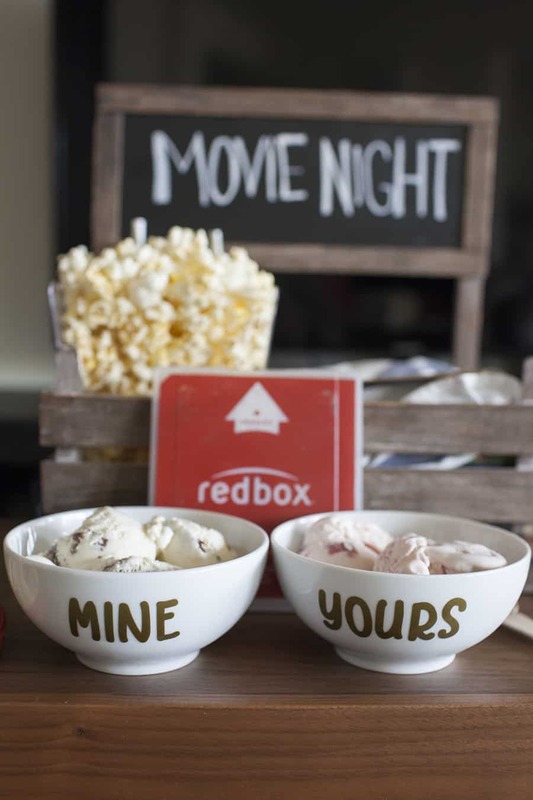 This movie night date crate is such an easy way to show that you’re thinking about the important of your quality time with your spouse, whether there’s a baby in the mix or not! A wooden crate with chalkboard. The original crate I used was from Hobby Lobby, but here is a great alternative from Amazon. Popcorn bucket. The original was also from Hobby Lobby, but this date crate would be super cute with an old fashion striped popcorn bucket. Ice cream bowls. You could get ice cream bowls with a design on them or plain white ones to be able to make your own “Yours” & “Mine” bowls. Drink Tumblers. These stainless steel ones are perfect for any kind of drink and they’ll be a great addition to your kitchen. Chalkboard pen or regular chalk. A favorite movie or a new one you rent. We love using Amazon Instant Video for this! You could also start and binge watch a new TV show. We love Man in the High Castle and Bosch (click to watch the trailer!) from Amazon. If you don’t have Amazon Prime yet, click here to sign up for a free 30 day trial! Once you have all of your supplies, you can begin working on your ice cream bowls (tutorial below). 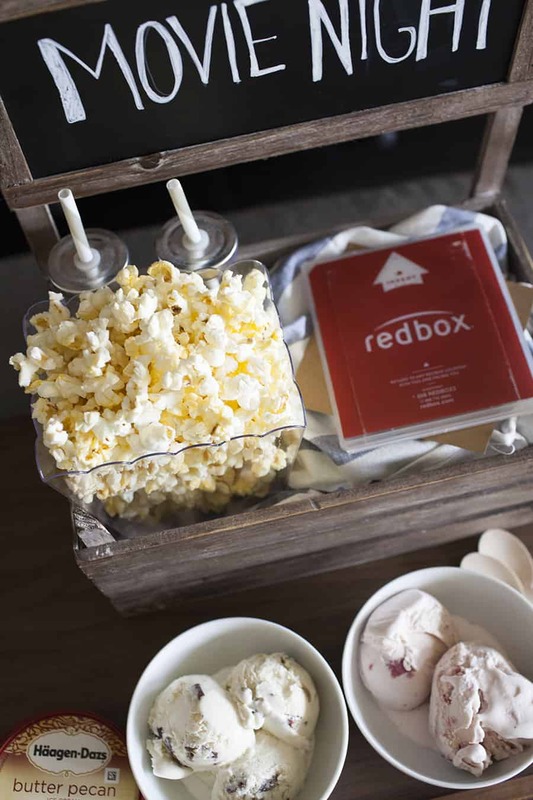 Then assemble everything in your movie night crate and surprise your guy or girl with this fun date night! 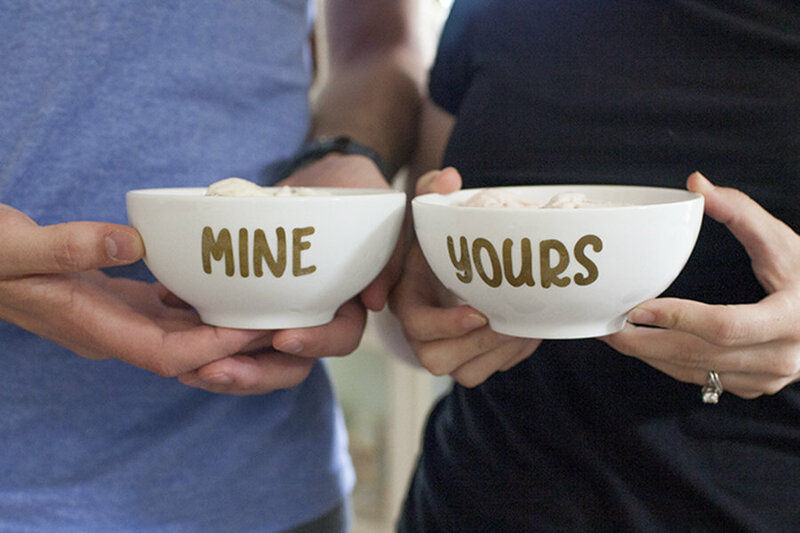 Making these ice cream bowls for your date night is super easy. 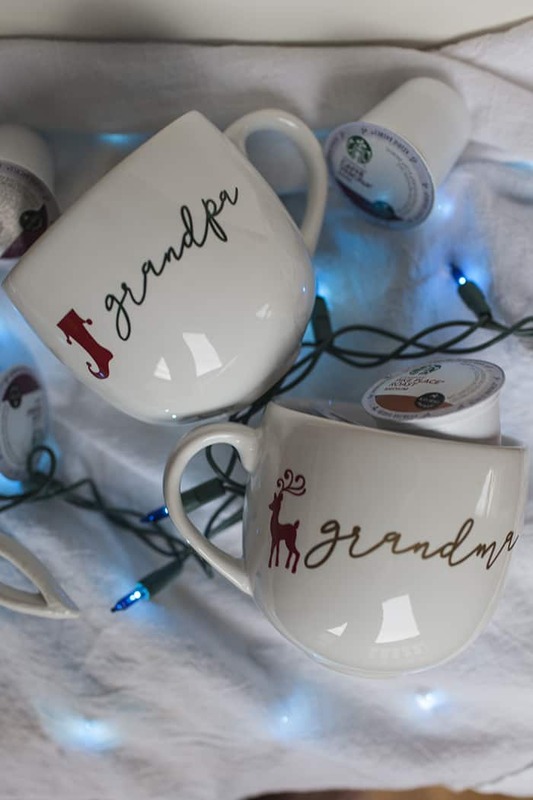 First, you’ll need an electronic cutting machine like a Silhouette Cameo or a Cricut. I’ve used both machines, but personally prefer the Cricut Explore Air™ Machine. You’ll also need some vinyl of your choice. I have found that for something like this, any brand should work just fine. 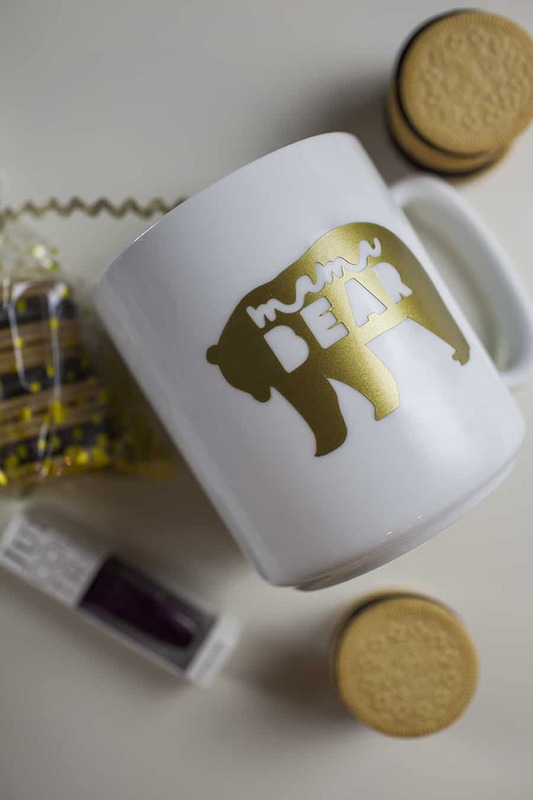 I used gold vinyl, but you can use any color you’d like. When you first get your Cricut Explore Air™ Machine there is a set up video that will walk you through your very first project. This is one of the reasons I preferred the Cricut machine. 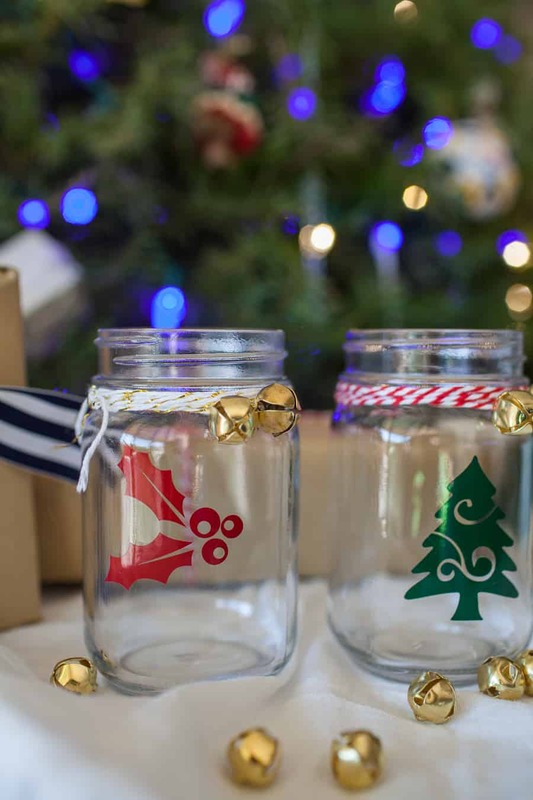 There are also tons of tutorials and project ideas on the Cricut blog! Once you get your machine set up, you’ll need your file for your “Yours & Mine” bowls. Click here to download the file I used! Open this in your design program for either machine. Load your vinyl straight into the machine (no cutting mat needed). Follow the steps for your machine to cut out the file. Then use transfer paper to transfer the design to your bowls. 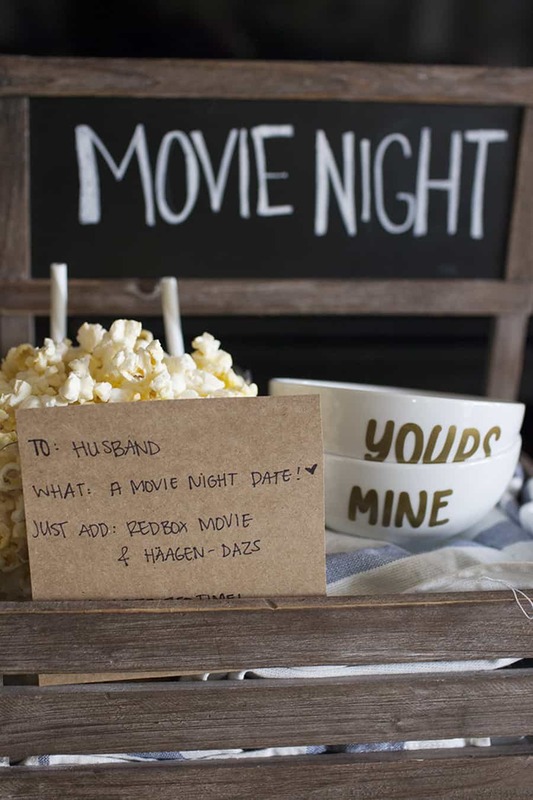 You could also use your cutting machine to cut out vinyl for your “movie night” chalkboard sign, if you don’t want to write it out! 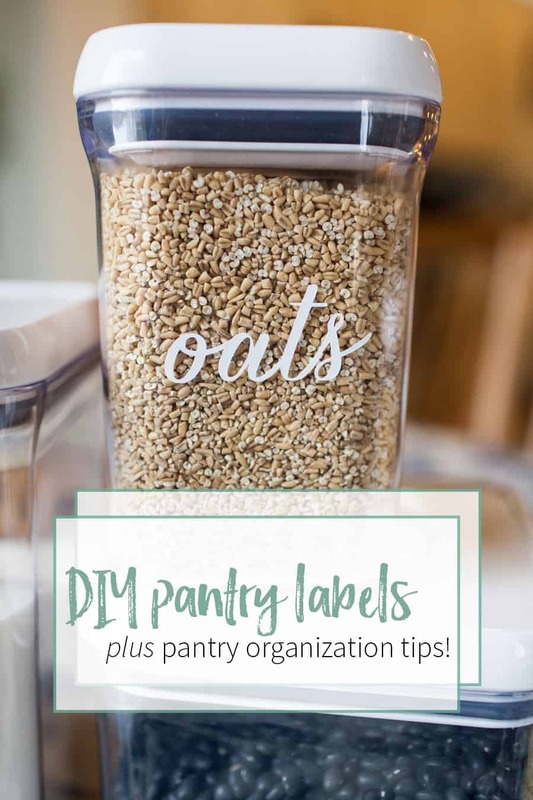 I also love these beginner vinyl crafts if you need more ideas for how to use your cutting machine! Whether it’s making sure your significant other knows that the date night is happening, planning to put the kids to bed early, or setting the scene by making sure there aren’t extra chores or to do’s to take care of after dinner, make a plan to make the date night fun and stress free! 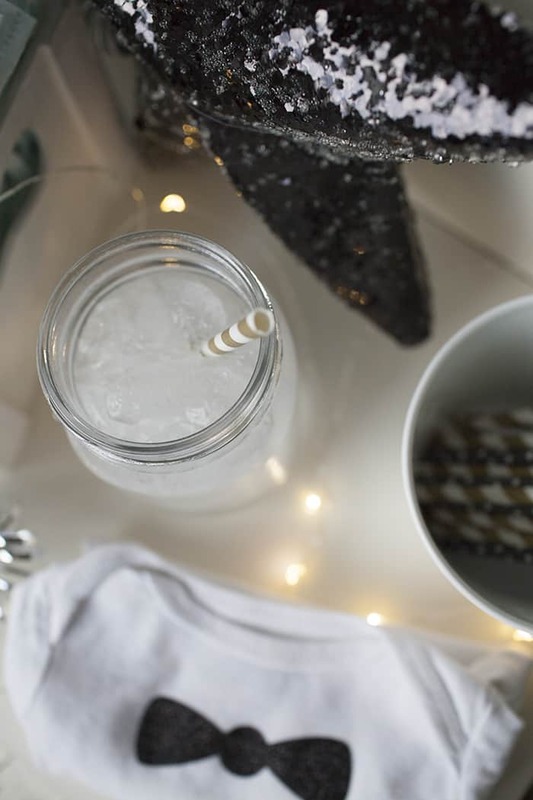 You’ll want to choose whether this date is after dinner, a romantic dinner at home, something to do once the kids are asleep or while they are occupied. Each couple’s date night at home may look different! Play your favorite board game. Cuddle up on the couch and watch your wedding video or home movies from when you were a child. Play some music and dance around the kitchen. Open a bottle of wine and read books on the couch together while playing the Fireplace “movie” on Netflix. Appetizer dinner night. Consider making a few appetizers in lieu of dinner. Some ideas are Goat Cheese Rosemary Baked Chicken Meatballs, Baked Caprese Dip, Prosciutto and Ricotta Thin Crust Pizza, or Triple Berry Brie Chicken Sliders. This is the perfect date night for anyone who just wants a quiet date night at home! What would you include in your date crate? This is seriously the cutest idea, Madison! 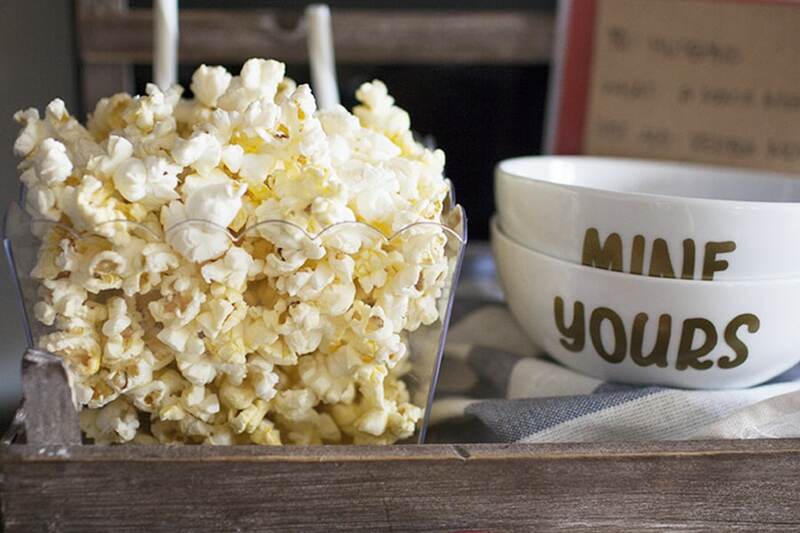 I love how your bowls turned out and enjoy the whole idea of date night in a crate. This would be fun to gift new parents! Yes, absolutely!! It’s a great (and cheap) date night idea for anyone! Aww I love this idea! We try to have a weekly date night and a lot of times we have date night at home. I know we will be doing date night at home even more once the baby is here! It’s really important for me to make time and do something special for date night since my love language is quality time, too. This is such a simple, inexpensive idea but it would be a lot of fun! YUM! And this is so cute! Enjoy date night! What a fun night! Those bowls are so cute! Where did you get the clear popcorn box? Hi where did you get the crate ? I love it !!! Hi Anthony! I think I got it from Hobby Lobby, but it was over a year ago! how and where did you make the bowls?!?!? This is beyond adorable!!! where did you get the chalkboard sign and how did you stick it to the crate please?